Tampa Bay Lightning captain Steven Stamkos felt he was playing the best hockey of his life through the first 16 games last season. He had 14 goals and nine assists. He was scoring and creating. He was backchecking and playing on the penalty kill. He was basically dominating all over the ice. The Lightning were 12-4-0 and in first place in the Atlantic Division. "That was exactly the way I wanted to play," Stamkos said, "with that mentality of being a difference maker and being the best player on any given night." Everything changed Nov. 11 at TD Garden. During the second period of Tampa Bay's 17th game, Stamkos crashed hard into the right post as he was coming back to help protect the Lightning net. His right leg bent viciously as his shin connected with the iron. He broke his tibia. 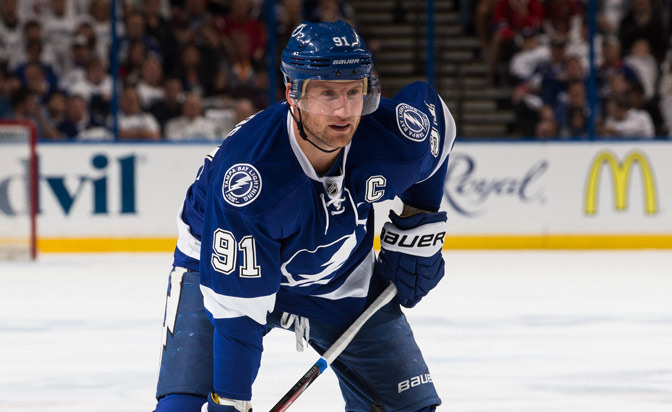 The rest of the season would be about Stamkos' leg, about surgery and healing, rehab and returning. Stamkos came back March 6, played 20 more regular-season games and four in the Stanley Cup Playoffs, scoring 13 goals, but he was not the same player, mentally or physically. He is now. Stamkos is healthy, healed, and thinking about scoring 50 goals again -- even dreaming about 60, a number he reached three seasons ago -- as the Lightning prepare to open the season Thursday against the Florida Panthers at Amalie Arena. "Getting to 60 was pretty amazing," Stamkos said. "I would love to get there again, but I do realize that is pretty tough." For all the moves general manager Steve Yzerman made during the offseason to bolster the roster and make the Lightning a Stanley Cup contender -- acquiring defensemen Anton Stralman and Jason Garrison, and forwards Brian Boyle and Brenden Morrow -- the best news for Tampa Bay is that Stamkos is 100 percent, and he's showing it every day. "He's back," Lightning coach Jon Cooper said. "You can tell by the way he gets up and down the ice. He's not apprehensive to go into a corner. He will go hard to the net. He's doing all those things he did pre-injury that he was not doing in the spring. It's clear." Stamkos still has a 16-inch titanium rod and one screw in his leg. The rod will stay in, but if the screw starts bothering him it can be extracted. It hasn't been a problem so far. He feels the doctors were right, that his leg is structurally stronger. He said he thinks he'll feel even stronger in a month, as he closes in on the one-year anniversary of his injury. "They say it's about a year from the injury that your body has to adapt to the new structure that it has with a foreign object in there, but it's almost night and day compared to where it was at the end of last year, and that's why I'm excited," Stamkos said. "There's still those days when it's sore and those days when you know there is a lot of scar tissue in there and that needs to be broken up, but just knowing the progress we've had it is definitely exciting for me." Stamkos is also playing center. He played on the wing when he returned to the lineup last season. In fact, the only time he played center after he came back from the injury was in Game 4 against the Montreal Canadiens in the Eastern Conference First Round. He went to Cooper before the game and asked if he could. It turned into a seminal moment in Stamkos' recovery, even though he didn't score and the Lightning lost 4-3 to end their season. "It wasn't a game we won, but I think it was a big step for me, just to get back to my natural position and know it was getting stronger and more comfortable and able to battle down low," Stamkos said. "It's little things like that, that obviously the normal fan watching the game wouldn't have a clue about, but for me it was a big step." Cooper compared Stamkos' return on the wing to a pitcher coming back from an arm injury to throw a simulated game. It was something he had to do to ease his way back in. Moving to center was like a pitcher taking the mound in a real game late in the season, just so he knows he can go into the offseason confident he's still got it. "So many factors went against us, but I think that was one of the factors that went for us, even though it's got kind of a hidden meaning," Cooper said. "I still think this is going to follow him for the next couple of years. There's always going to be some shade of doubt. I think that happens in anybody's head that has had a major injury, but his natural instincts were guarded last year where I can see this year it's not like that." "Hockey is such a reactionary game, and for me, thinking one play ahead and using your hockey IQ, that's an advantage I have," Stamkos said. "When you're thinking about how to brace yourself because of your leg instead of thinking about the next play, it affects the way you play out there. It took me a while, but I'm definitely in a better spot now, that's for sure." So instead of thinking about his injury, Stamkos thinks about the first 16 games he played last season. He remembers everything. His challenge is to feel and perform that way again, only this time for a full season and, if all goes well, a long playoff run. "I know exactly the way I felt, the way I approached games, the way I was focused on what I wanted to focus on," Stamkos said. "It was little things that made me successful at both ends of the rink. The offensive numbers were still there because we were playing the game the right way. "That's the goal, to get back to that."